A backyard fireplace is probably one of the most rewarding investments for your Milton, MA home. Not only does it add to the opulence of your property, but also makes your yard a comfortable gathering place for friends and family. However, keeping a fireplace safe and functional requires some care, and knowing what to look out for can help you enjoy your fireplace to the utmost. Safety is paramount with any fire feature, which is why it is important to revisit the placement of your fireplace. Ensure that plants remain a safe distance from the fireplace, especially after spring summer when most plants go through a growth spurt. Ask your landscaper to trim back branches and ensure that the fireplace’s location is still optimal. Moreover, try to keep the fireplace away from flammable structures and consider relocating it if you have carried out an extension or renovations. Regular use, high working temperatures and exposure to the elements can take their toll on the various parts of your fireplace. Gas fireplaces, in particular, have to be checked more often, given they have a more complex design. It is important to ensure none of the gas lines, fixtures or valves are leaking. This can be done by your landscaper. Similarly, the burners and pilot light should also be examined for corrosion, given their exposure to the elements, as problems with them can result in trouble with lighting up and maintaining a flame. A clean and free-flowing chimney is an integral part of any fireplace. A quick inspection of the chimney should be carried out by the homeowner before every use to ensure that it is free of serious blockages. Typically, fireplaces with clogged chimneys experience back puffing, emitting smoke through the opening rather than through the chimney. This can be caused by leaves or debris accumulating, especially during the fall, as well as due to the build-up of soot and creosote. In either case, a clogged chimney is a significant fire hazard and a professional should be consulted, especially after a prolonged period of disuse. Creosote build-up, in particular, is quite dangerous given its inflammable nature. No fireplace should be used if the build up is thick and tar-like, as this is more susceptible to catching fire. Lastly, consider investing in a chimney cover or grill to prevent debris from falling in. Fireplaces are constructed from a wide variety of materials. Some are more susceptible to degradation over time than others. This is partly due to the high temperature variation, as well as constant exposure to the elements that an outdoor fireplace is subject to. Check the fireplace for cracks and consult a professional over the proper repair procedure. Filling in a crack with the wrong material can cause excessive expansion and exacerbate the crack over time. Similarly, exposure to the rain can result in crumbling masonry, especially inside the chimney, which is often less protected. Coating the entire fireplace with a sealant after repairs is one excellent way to mitigate any potential disasters. Lastly, fireplaces tend to be heavy structures that can cause the soil underneath them to compact. This can result is the ground settling under the structure, potentially causing it to become unstable and a safety hazard. In any of these scenarios, contacting a professional is the best option, given the high-risk nature of structural problems with fireplaces. This entry was posted in Design & Construction and tagged Backyard, Landscape Design, Landscape Maintenance, Masonry, Outdoor Fireplace on April 6, 2018 by 12850420. The arrival of summer means getting outside to enjoy the warm weather. If your Walpole, MA, backyard is lacking appeal, let Towne Tree and Landscaping, Inc. give it new life. Updating your landscape design can extend your living space and create a yard that you won’t want to leave. Transform your landscape into the perfect summer escape with one of these backyard design ideas. If you just want a quiet place to escape to, a backyard Zen garden is the perfect solution. A pond creates a beautiful focal point for a traditional Japanese garden. Whether you opt for a modern patio pond or a natural stone pond, the soothing sounds of moving water will provide a tranquil atmosphere. 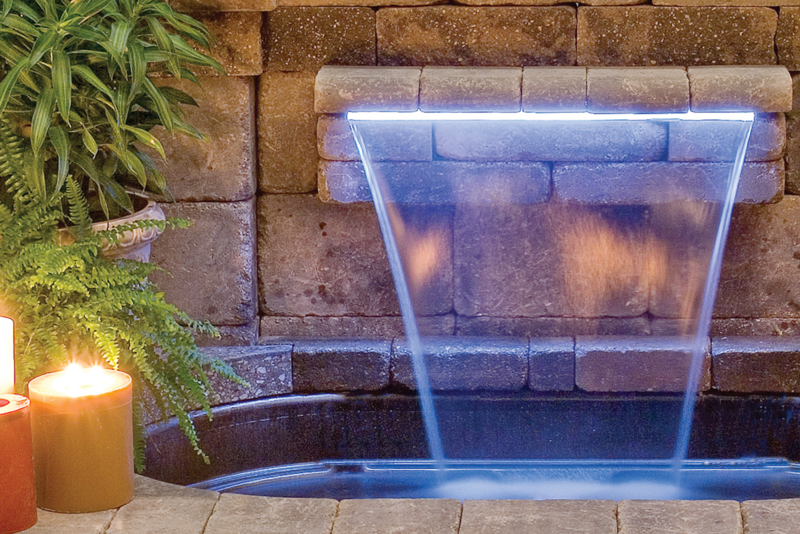 A fountain will allow you to enjoy the peaceful sounds of a water feature without the maintenance of a pond. Instead of a traditional lawn and flower beds, opt for a rock garden with sweeping curves and sand or river rock in place of grass. A Zen garden favors soothing shades of green over brightly colored flowers. Plants such as bamboo, dwarf pine and Japanese cedar will bring life to your Zen garden without detracting from the tranquil feel. Create the feeling of an outdoor spa right in your backyard. A soothing hot tub is a must-have feature for a backyard that makes you feel pampered. Surround the hot tub with a gorgeous multi-level wood deck and comfortable seating to recreate a relaxing outdoor retreat. An outdoor bar will give guests a place to sit and relax with a chilled drink. A fireplace to add warmth after a soak on a cool night will round out the perfect backyard spa design. 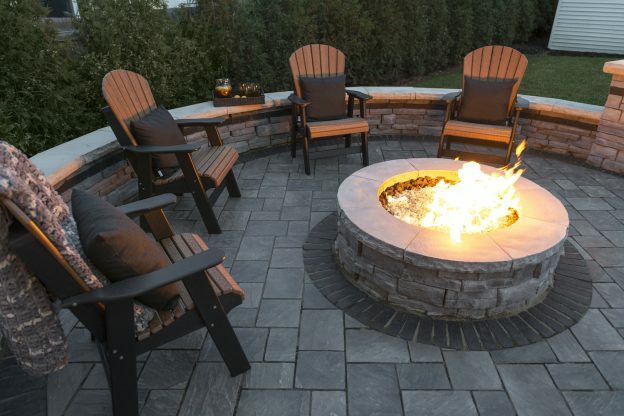 A fire pit with built-in seating creates a cozy atmosphere and invites friends and family to gather and stay awhile. It also means chilly nights won’t end a great outdoor gathering. A fire pit offers design flexibility and is adaptable to any size or style of landscape. A gas-fuelled fire pit will complement a modern landscape, while a natural stone, wood-burning fire pit will fit a less formal yard. No party is complete without good food! An outdoor kitchen will make your backyard even more enticing and allow you to cook entire meals without leaving your guests. Think beyond a BBQ and incorporate a grill, side burners and fridge to ensure you have everything you need on hand. To truly expand your living space into your yard, bring technology outdoors. A fully equipped outdoor living room is so much more appealing than a dark man-cave. Outfit your space with a good music system and surround sound. For a unique experience, create a theatre under the stars with an outdoor flat screen TV, or a projector and a backyard movie screen. Keep drinks chilled and close at hand with a convenient patio cooler. If you prefer high-tea over high-tech, an English Garden is the perfect backyard design. Classic brick masonry will provide the backbone for a traditional English Garden. Raised planters and a formal patio will give form and function to your landscape. Soften the hardscaping with an abundance of bright blooms, such as roses, peonies and Iris. Boxwood hedges can add privacy or create borders for walkways or flower beds. For an even more formal look, a well-planned knot garden will add structure and balance to any landscape. This entry was posted in Design & Construction and tagged Backyard, Lounge, Outdoor Living, Patio, Spa on March 29, 2018 by 12850420. A seat wall is so much more than a rustic take on outdoor furniture. These low walls are often positioned along the edges of an outdoor room, thereby separating it from the next. This enables the individual atmosphere of each outdoor room to be appreciated in isolation. Seat walls can also be hollowed out to function as additional storage space – a feature that is particularly valuable for patios that lack plenty of space. These convenient spaces can be used to stow away delicate items that may be damaged by harsh weather. Seat walls can also serve as convenient spots to place drinks, snacks and decorative items like planters. We all want to fill our outdoor spaces with luxurious materials like real granite and ornate glass tiles. However, this can break the bank and create a disorderly mess of materials, all competing for their place as the focal point of the hardscape. Therefore, it’s important to utilize showy materials in small, powerful doses. This will ensure that their beauty and superiority comes across clearly. Have your seat walls veneered using authentic natural stone and allow them to stand out boldly against your patio floor and surrounding softscape. Stone veneer is relatively thin and easy to install, cutting material and installation costs. Seat walls constructed from concrete wall units, or large units of natural stone, are guaranteed to withstand natural wear and tear. Should you decide to adorn your seat walls with comfortable cushions, you should have a safe space in which to store them when the weather takes a turn for the worst. Your capstones should be slightly angled to prevent the accumulation of rain water on their surfaces. Stagnant puddles can discolor capstones, depending on their composition and level of water resistance. Despite the stunning impact that can be made by a stone seat wall, these low structures can also be constructed from brick or concrete units. Select materials that enhance your existing hardscape and serve to amplify its aesthetic theme. Seat walls often enclose outdoor rooms, and therefore have a role in defining the look and feel of the room. 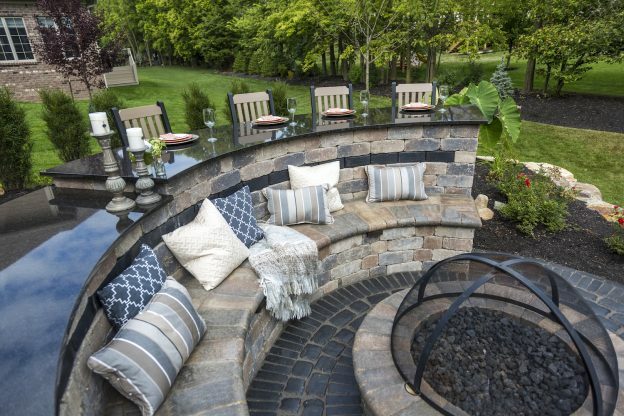 Incorporating a fire pit, or other fun feature, into the arrangement can also serve to make your seat walls more inviting. Incorporating sleek lighting into the structure of your seat walls can also contribute towards a more functional and attractive design. Low voltage LED lights can be fitted underneath the overhang of the capstones. Consider chic strip lighting, or single lights placed at moderate intervals. This type of lighting will not only ensure your safety while navigating the hardscape, but will also illuminate the texture of the wall and highlight its presence as a distinct focal point. This entry was posted in Design & Construction and tagged Concrete Wall Blocks, Landscape Design, Natural Stone, Outdoor Living, Seating on March 23, 2018 by 12850420. Outdoor lighting not only extends the hours that you can enjoy your Hanover, MA, backyard, it can also help to make your landscape safer. Well-planned landscape lighting will transform your yard from a dark, foreboding space to a warm and inviting area. 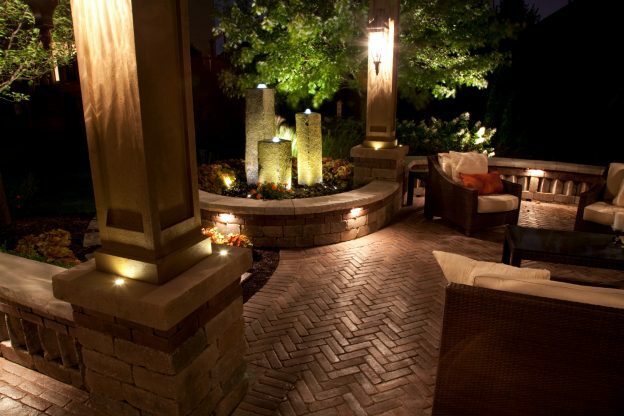 Consider these outdoor lighting ideas to create a beautiful atmosphere and a safer landscape for you and your guests. Aside from aesthetics, there are three main areas of concern when designing a comprehensive outdoor lighting plan. You want to make your yard easy to navigate for your family and friends. You also want to deter would-be criminals or vandals from entering the yard. And you want to eliminate areas where potential dangers could be concealed. A professionally designed outdoor lighting system will highlight the best features of your landscape while addressing issues that an untrained eye may not be aware of. A landscape design company, such as Towne Tree & Landscaping, Inc., can identify problem areas and potential hazards, such as low-hanging branches or a change in grade. They’re also knowledgeable about which type of lights work best for a particular location and how to properly position lights to avoid dark shadows. Automatic lighting control systems can help make your outdoor lighting system more convenient and effective. A control system can turn lights off or on at intervals or specified times, and can also change lighting levels. An automatic system will save energy by ensuring lights are only on when necessary. Timers, light sensing photocells, and motion detectors all offer added security when properly installed in combination with well-placed lighting fixtures. A control system can also help to ensure that lighting for safety remains on all night, while lighting for aesthetics is turned off when not needed. Good outdoor lighting will ensure that everyone can move safely around your yard. Well-lit walkways and transition areas are key to making your yard easier to navigate. Post lights are effective at entrances to walkways or driveways to highlight access points. The goal is for guests to easily locate gates and entryways while deterring intruders from entering a well-lit area. Path lighting will help guide visitors and direct the flow of traffic while making potential tripping hazards visible. Path lights should shine downward, creating a soft glow that illuminates the ground without any upward glare. Step lights are a stylish and unobtrusive way to improve safety on stairways. Small, flush mount lights are installed on the front of risers or under tread lips to highlight steps at foot level. Features that are considered fun during the day can present significant dangers at night. A pool, for example, is an extremely popular feature in any yard, but without proper lighting, a pool is off limits after dark. For maximum safety, a poolscape should feature a combination of underwater and above ground lighting. Beautiful LED underwater lighting systems have replaced bright underwater spotlights, creating the perfect atmosphere for safe nighttime swimming. Well-lit entry points such as stairs, ladders, and pool edges will increase safety for those in and out of the water. Cooking without proper lighting can also pose many dangers. An outdoor kitchen should feature good overall lighting, as well as task lighting on counters, cooking surfaces, and sinks. Adding dimmers to your kitchen lighting will allow for maximum brightness while cooking, that can be toned down when the meal is done. This entry was posted in Design & Construction and tagged Landscape Design, Outdoor Kitchen, Outdoor Lighting, Outdoor Living, Safety, Swimming Pools, Walkways on March 12, 2018 by 12850420. Natural stone’s unparalleled elegance and beauty make it one of the most popular materials for outdoor patios in Hanover, MA. 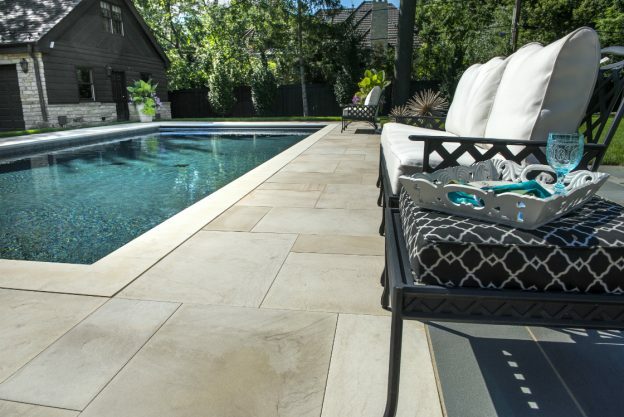 Aside from being a gorgeous visual addition to an outdoor space, natural stone is also known for its durability and strength. When choosing the right type of stone for your patio, one of the most important things is finding the golden mean between performance and appearance. The three key metrics to consider when selecting the right stone for a patio are texture, shape, and color. Fieldstone offers a traditional look and impresses with its warm earthy tones. This natural stone is ideal if you are after an organic, rugged look that will add subtle contrast to bolder colors and complement existing greenery and water features. Fieldstone is suitable for use around pools because of its texture which guarantees a reliably non-slip surface even when wet. As well as being used for paving, fieldstone can also be stacked to form walls and low-to-the-ground structures. Fieldstone is great for creating patios and outdoor spaces with a cottage or country theme. 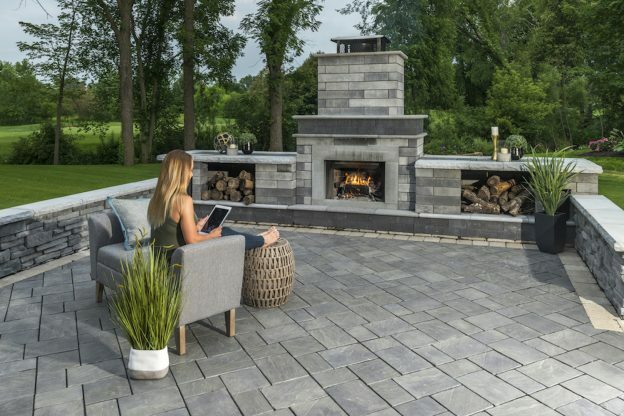 One of the most popular natural stones, bluestone comes in a variety of stunning blue, grey, brown, and even green hues that match both contemporary and traditional backyard styles. If bluestone is machine finished, it will provide clean lines that work perfectly in a minimalist environment. If you want to be creative with the laying patterns of the patio, bluestone offers a sandy texture and layered appearance that will make an intricate mosaic even better. Because of the coolness of its coloring, bluestone is ideal for creating spaces with a formal, sophisticated feel. This natural stone is often sourced from India or China, although local varieties do exist. Sandstone comes in a variety of colors, grey and gold being the most common. Sandstone offered by Unilock is quarried in India and impresses with its color palette of subtle colors, varying textures, and durability. Unilock offers excellent quality natural stone sourced from trusted quarries around the world. A variety of surface treatments ensure natural stone with low water absorption, high flexural strength, and excellent freeze-thaw durability. Another thing that makes Unilock Premium Quality Natural Stone so special is its consistency of thickness and dimensions. Sandstone can offer a sunny, beachy feel to your patio, or rich, natural aesthetic that is compatible with a rustic theme. Because of its elegant colors and refined, almost silky surface, limestone is the ultimate attention grabber and will turn your patio into the focal point of your landscape. Limestone by Unilock is a natural stone with exceptional quality that blends with virtually any type of landscape design. However, limestone is especially ideal for modern landscapes because of its fine detail and sleek sophistication. This entry was posted in Design & Construction and tagged Bluestone, Landscape Design, Limestone, Natural Stone, Patio, Sandstone, Unilock on February 28, 2018 by 12850420. 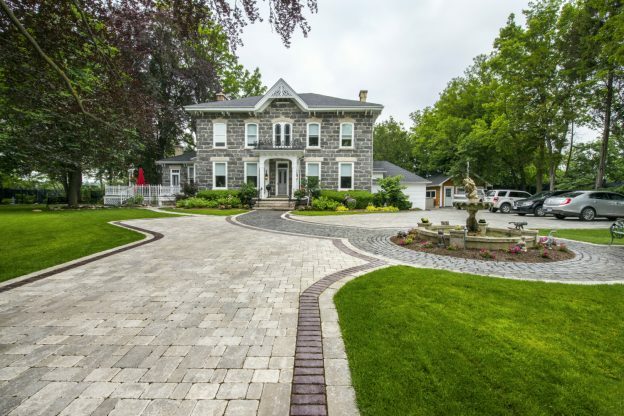 The inherent refinement and traditional appearance of brick can make it the perfect addition to a rustic, farm-style home, a traditional landscape, or even a manorial estate in Walpole, MA. Whether you have a grand entrance or casual walkway in mind, the width, shape, and paver pattern of your brick walkway can be customized to suit your desired aesthetic. 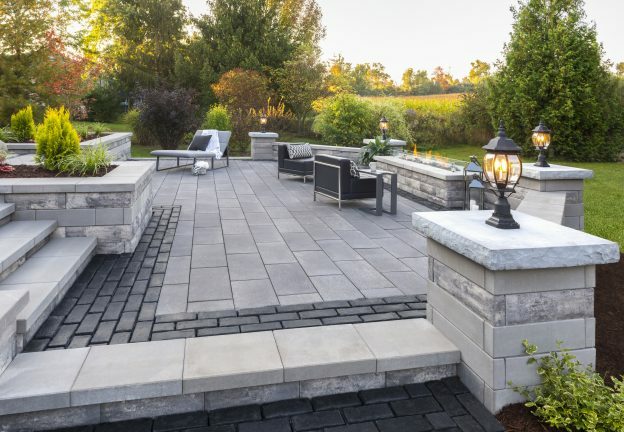 Bricks are incredibly versatile and can be used in conjunction with a range of other paving materials like concrete, natural stone, and cobblestone. Read on to discover how we can help you create unique brick walkways that personalize your property. 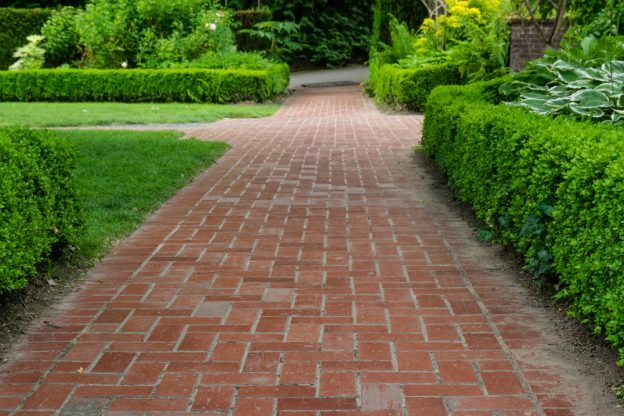 Straight brick walkways tend to draw one’s attention to a focal point situated at the end of the path. This can be a swimming pool, an elegant gazebo, or the front door to your home. A crisp and stunning brick pathway that leads up to the front door can make it seem more welcoming by highlighting any warm, traditional elements present in the home’s design. A running bond laying pattern, with its rows of bricks laid parallel to the path’s trajectory, can visually lengthen the path. With the same pattern laid crossways, the walkway can be made to appear wider. Curved walkways tend to offer a greater sense of mystery compared to straighter routes. This is because their destinations are more obscured. Incorporating curves into the design of your walkway will also make it more compatible with a more naturalistic design theme. Brick walkways are often framed by an extra layer of bricks that have a different design or are laid in an alternate direction. This is known as a course. Some popular varieties of courses include the Stretcher Course, in which the bricks used for the border run parallel to the main field with their narrow side showing. Another popular border is the Soldier Course, in which the narrow edge runs perpendicular to the main field of pavers. You can explore bricks of different colors and finishes until you find a variety that suits the rest of your landscape. Walkways can also be framed with vegetation, such as small shrubs and flowers. This has a way of blending the walkway with the surrounding softscape. Combining a variety of materials can enrich the appearance of a walkway and result in a more captivating and memorable design. Laying brick and stone in an alternating pattern can create the appearance of a rustic quilt, perfect for a cozy dining area hidden between trees and shrubs. Alternatively, cobblestones can be used to create borders that give the path a wonderfully antique appearance. The warm red of brick pairs excellently with the dark charcoal of slate or basalt, and can be used to complement a bluestone patio or poolscape. If you desire a cohesive landscape with a seamless visual flow from one hardscape feature to the next, consider using the same style of brick throughout. Walkways, patios, and low walls can be constructed using bricks with the same color and finish for a totally unified end product. To break up the monotony of face brick, borders and accents of a different color or material can be used. This entry was posted in Design & Construction and tagged Brick, Curb Appeal, Front Entrance, Landscape Design, Paver Patterns, Walkways on February 18, 2018 by 12850420. Hiring a commercial snow removal service will ensure that your Hingham, MA, business operates smoothly despite poor weather conditions. Keeping your business venue clear of snow will prevent harm to your clients and employees, freeing your company from liability. By plowing the parking lot, deicing the sidewalk, and performing a range of other tasks, a snow removal service will ensure that your commercial property is always prepared for winter. Contact Towne Tree & Landscaping, Inc. to inspect your property and determine the best strategies for snow and ice removal for your business. As a commercial property owner, it is your responsibility to ensure that drivers and pedestrians can safely traverse your property and parking lot. In the winter, this entails keeping your parking lot clear of ice and snow. If someone were to slip on ice, or a collision was caused by unsafe conditions, your business could be held liable for medical expenses, a loss of wages, and damage to personal property. Potential clients also tend to formulate their opinion of a business from the moment they pull into the parking lot. A dangerous lot that offers a treacherous path to the front door can make a strongly negative impression on potential customers and suggests that your business does not care about the wellbeing of its clients and employees. Professional commercial snow removal service, such as that offered by Towne Tree & Landscaping, has the staff and equipment needed to make quick work of your parking lot and keep it in good shape all winter long. Parking lots that have not been plowed or deiced can possess obscured parking lines that make it difficult for drivers to determine where they should park. This uncertainty tends to lead cautious drivers to park further away from adjacent vehicles than necessary. This wasted space could actually leave you with fewer parking spaces than your business actually offers, potentially turning away willing customers because of space restraints. Hire a reliable commercial snow removal service that will plow your parking lots regularly and ensure that parking bay demarcations are always visible. Collaborating with your commercial snow removal company will help you to determine the most efficient and convenient times for parking lot plowing, deicing, and snow removal, in order to not interfere with the operations or appearance of your business. Hiring a professional snow removal service will allow you to rest assured, knowing that your driveway, sidewalk, and parking lot will be kept clear all winter long and that you won’t be met with any unpleasant surprises. Many business owners are reluctant to invest in professional snow removal, as they are concerned about the effect that its cost will have on the business. However, commercial snow removal services have proven to save countless businesses from having to cover the additional expenses that come with acquiring, storing, and maintaining commercial grade snow removal equipment. A professional service will also complete the task in a fraction of the time taken by inexperienced or unequipped personnel. 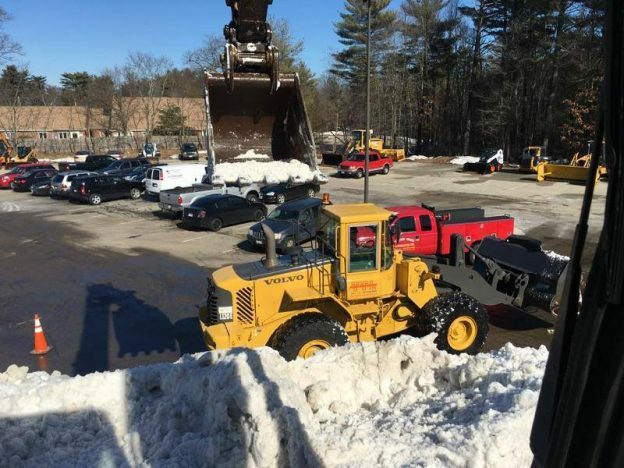 Related: Have You Found a Commercial Snow Removal Company for Your Duxbury Property Yet? This entry was posted in Snow Removal and tagged Choosing a Landscape Contractor, Landscape Maintenance, Landscaping Services, Snow Removal on February 12, 2018 by 12850420. A design-build company is staffed with skilled designers and builders. These experts work as a single entity on planning and executing your project from the beginning to the very end. Design-build teams focus on completing a project that meets and exceeds the client’s expectations. One of the biggest advantages of a design-build company is that one person, usually a project manager, is accountable for everything. Dealing with both an architect and a general contractor and coordinating their communication can be overwhelming. Working with a unified team means that regardless of the challenges the team encounters, the issues will be dealt with by an experienced individual to successfully finish the project. For increased efficiency, you only need one team who is invested in making the project as cost-effective as possible by having their expert staff readily available in order to offer open communication and collaboration. That by itself will contribute to a shorter timeline. Starting a project with one company allows the team to calculate everything that will go into designing, building, and organizing all of the smaller details. This gives them an opportunity to get involved in the project from start to finish, ensuring continuity of labor. The team will know why you want and need certain things, and the initial intention of the design. They will also develop a greater understanding of your preferences and personal style and deliver to you your desired vision. The entire team will be actively invested in overcoming the challenges together. On the other hand, this can be diluted amongst the subcontractors when working with a basic landscape contractor. The designer, for example, may move on to other projects and not be actively present during the building process. For homeowners, quality matters, however, there is no point in remodeling your home and ending up with something with which you are not satisfied. A design-build company focuses on the design and the craftsmanship that goes into the design as a single project. One of the biggest problems with hiring a basic contractor is that you never quite know how the building team might alter what the design team has put into place and what the final result might be. This entry was posted in Design & Construction and tagged Choosing a Landscape Contractor, Landscape Construction, Landscape Design, Professional Design Build Company on February 3, 2018 by 12850420.